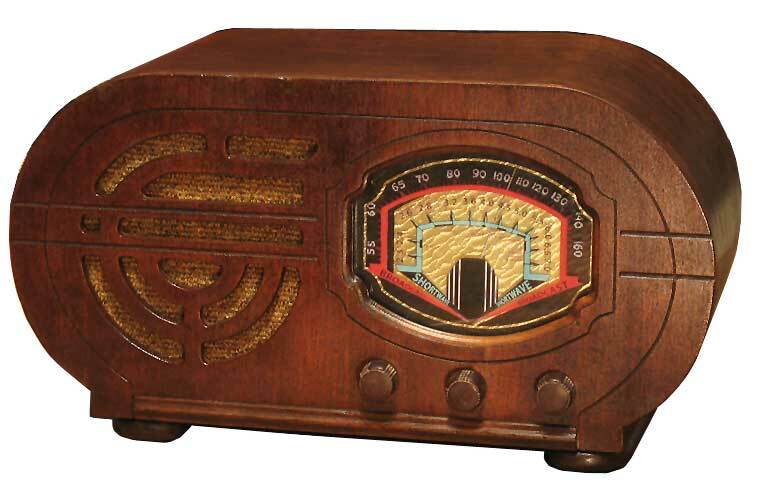 This nice oval-shaped wood radio is a so-called Plant C radio with the telltale yellow and black tag on the chassis. These Plant C radios were manufactured in Chicago and usually sold under a variety of generic names. There is no manufacturer or any brand name markings anywhere on my example, but I have seen identical examples with the Clinton nameplate so this radio was most likely manufactured by Clinton Mfg Co. No schematic can be found in Riders, but there is one glued on the bottom of the cabinet like many Plant A and C radios. Usually a model number is shown on the schematic, but unfortunately on my example the model number was on an torn off corner of the glued schematic. I was able to determine the model number after inspecting a complete schematic on an identical Clinton radio that read two models: 216 and 149. The model 216 is described as an oval radio in a radio collector price guide so my best guess is this radio is a model 216. The dial artwork is similar to other known Plant A and C radios. The cabinet is very similar to the highly desirable Silver Marshall 139 and the dial is similar to a Clinton 127 and Silver Marshall 146. I first saw the radio in an antique store in Salado, Texas in fair condition, but nearly all the dial paint had flaked off so I was reluctant to take on a project with a dial that was not likely to be replaceable. I passed it up but several months later I went back to the same store only to see the radio still sitting there. I finally caved in and bought it. The radio had sat for 7 years until I could figure out how to reproduce the dial. The solution was to reproduce the dial image in Photoshop as seen below after carefully examining pictures of other examples, print out on a transparency with a color laser printer, and then use a white paint pen to fill in the areas where necessary.